After a few days of intensive heat and thunderstorms, the weather was kind to us and we all had a pleasantly cool morning walk across the Ridgeway in sight of the famous White Horse with 15 Lagotto and owners. Having adjourned to the pub for some well earned refreshments, the sun came our way. 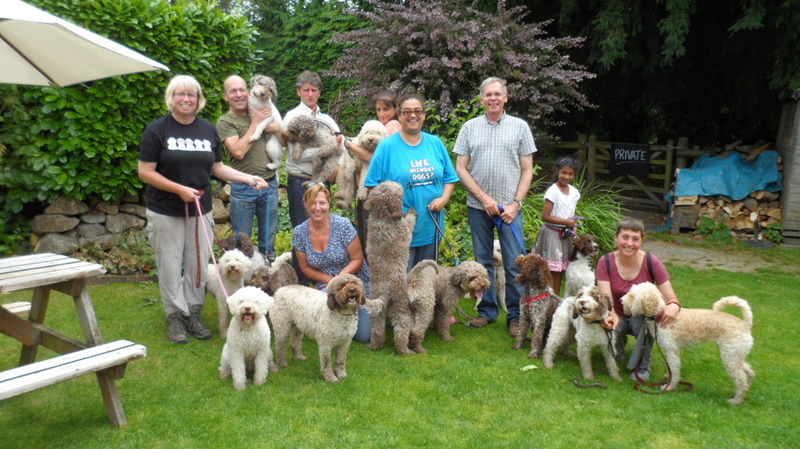 Back at the Village hall in the afternoon, we all heard Marion Dean(Truffle Hunters Dog School) talk to us about how she and her Lagotto, Mufti got into the world of Truffling. A very interesting and informative few hours with friends, even if the dogs could hear an approaching thunderstorm. Afterwards, some of us went to a nearby "secret" lake thinking that the thunderstorm had rumbled passed. Imagine our surprise when, all of a sudden, the hail just fell...ouch that hurt. By the time the humans scrambled into the thicket, we were all soaked to the skin...what did the dogs care, they were wet already. A very damp drive home!! But a great day nonetheless.